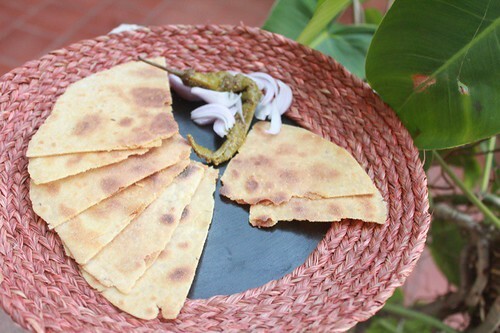 Khakras or crisp rotis are a popular preparation of Gujarat, but in this post, we bring to you the traditional Maharashtrian Khakra recipe as taught to us by Ina Talpade. Her family belongs to the Pathare Prabhu community of Maharashtra, but since their forefathers came from Gujarat, one can see the Gujarati influence in their cuisine. This Khakra is a staple food of the Pathare Prabhu community, and her husband Bholanathji remembers his mother preparing these khakras every other day. Inaji said that even though this recipe looks quite simple, it requires skill and patience, and is best learnt by observing elders in the kitchen. 1. Mix a little salt into the wheat flour in a plate with rimmed edges. Traditionally a plate with broad rimmed edges known as paraat is used to knead dough. 2. Heap the flour in the centre and make a well in the middle. Pour the oil in this well and gently mix into the flour. Mix thoroughly and patiently. 3. Knead it into a soft dough. 4. Divide the dough into 8 equal portions and roll into smooth balls. 5. Take the first ball, flatten it gently and roll using a wooden board and rolling pin. Roll into a circle of 5 inch diameter. Apply 1 tsp ghee on top evenly using a spoon. Sprinkle 1 tsp rice flour over it and fold into half. Again, apply ½ tsp ghee and sprinkle ½ tsp rice flour. Fold into half. This will now look like a triangle. 6. Roll it again, using light & even pressure, into a thin circular roti of approximately 12 inch diameter. As you roll, keep on patting rice flour on both sides to prevent it from sticking to the board. 7. Gently and deftly, transfer the rolled roti on to a preheated tava (skillet). The entire cooking must now be done on low flame. Within a few seconds, when the colour begins to change slightly, flip over. After half a minute, smear a little ghee and flip again. Using a spatula, begin to gently press down, all the while allowing the roti to move in a circular fashion so that it does not stick to the skillet. Apply ghee, flip over and repeat. The khakra will become brown and crisp in 2-3 minutes. 8. Fold into triangle, remove from tava and allow to cool. Enjoy with any side dish, dal, pickle or even aamras (mango juice) in summer. You can also store these khakras in an airtight container for up to a fortnight. This recipe was first featured in Soul Food and Soul Mates – a column in Harmony Magazine. Part-1 of this post is the interview with Ina & Bholanath Talpade – a Maharashtrian couple from Bangalore.